Faiza has been the Director of the Nairobi Office of Equality Now since 2000, and has more than 20 years of experience working with international organizations. 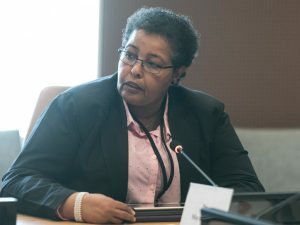 She has also worked extensively as part of the women’s movement in Somalia and was instrumental in the coalition-building of women’s organizations, with a focus on promoting peace, gender equality and advocacy for women’s rights. Faiza is a member of the African Union Women’s Committee, the African Women’s Rights Observatory panel, the Oxfam International Pan Africa Advisory Group, and the East and Horn of Africa Human Rights Defenders Network. Faiza’s current priorities include combatting youth female genital mutilation (FGM), and looking at how to make the workplace more safe for women.